THE HALL FAMILY(From bottom left to right) Lily, Hana, Ryan, Sara, Mia and Jasmine. Sara Hall has accomplished plenty since her days at Stanford University. She's represented the United States at three World Indoor Championships for track and field and a World Championship for cross country. In 2011, she took home a gold medal at the Pan American Games in steeplechase, and in 2012 she won the USA Track & Field Championship in cross country. Right now, her focus is on the Santa Rosa Marathon. Despite traveling the world for her running career, overseeing her family's Steps Foundation and visiting her children's home country of Ethiopia, Hall is looking forward to returning to her hometown and racing the Santa Rosa Marathon Aug. 27 for her first time. "It's been really great to see the Santa Rosa Marathon grow as an event and really become a great opportunity to showcase my beautiful hometown," Hall says. Hall will not be participating in the race on her own. Her husband, Ryan—who represented the United States in the 2008 and 2012 Olympics and holds the record for the best times for an American in the half marathon and marathon—will be running alongside her in a 5k race. Ryan will also be coaching their four daughters—Hana, 17; Mia, 15; Jasmine, 10; and Lily, 7—along the way. On top of that, Sara's parents will be joining her in the race. It's a family event, something the Halls rarely get to experience. "Events like the Santa Rosa Marathon are a great way to introduce kids to running and launch them into an active lifestyle," Hall says. "All of us will all be running the 5k on Saturday." The Hall sisters were never forced to follow in their parents' footsteps; they found a passion for running on their own. "We try to keep it fun for them at this point," says Sara. Hall and her husband will be busy throughout the weekend, starting with a farm-to-table dinner at DeLoach Winery on Friday. Following the race on Saturday, they will attend the race expo to talk with other runners. On Sunday, Hall will compete in the half marathon, and Ryan will be at the finish line hanging medals on runners from around the world. Orhan Sarabi, Santa Rosa Marathon race director, is delighted. "Sara and Ryan make up, in my opinion, the most decorated couple in distance running." The Halls' presence will add a certain cachet to the event, for both the participants and the Hall family. "For Sara, who is a local running legend, to be able to come back and run with her parents, children and competitively is a unique experience," says Sarabi. "Ryan and Sara's sincerity, passion and their giving nature make me respect them on many levels." And running is not the only thing the Halls are passionate about. In 2009, the Halls founded the Steps Foundation, a nonprofit focused on protecting and empowering women and children in poverty-stricken Africa. The Halls encourage runners to crowdfund each time they race, with the funds going to various endeavors, including grants to orphans in Ethiopia and health clinics throughout Africa. Hall was inspired at a young age to make a change in her community, when she witnessed poverty firsthand in San Francisco. But it was trips to Mexicali, Mexico, with her youth group that motivated her to take action. "My time there marked my life, and I knew that whatever I did, I wanted to bring justice to areas like these." After graduating from Stanford, Hall planned to work for a Christian charity, but she says her faith played a major part in changing her course. "I had the opportunity to compete professionally and felt God was telling me that I could do more through my sport than I could with my own two hands." Her most recent success with the Steps Foundation came from raising funds to build a hospital in Kenya. Meeting those who had been impacted by the hospital had a large effect on the Halls. "You don't often get to see the beneficiaries in such a tangible way, so that was really special." The Halls' next endeavor will take place in Ethiopia, where poverty and disease has left an estimated 4 to 5 million orphans, and where the Halls adopted their four daughters. 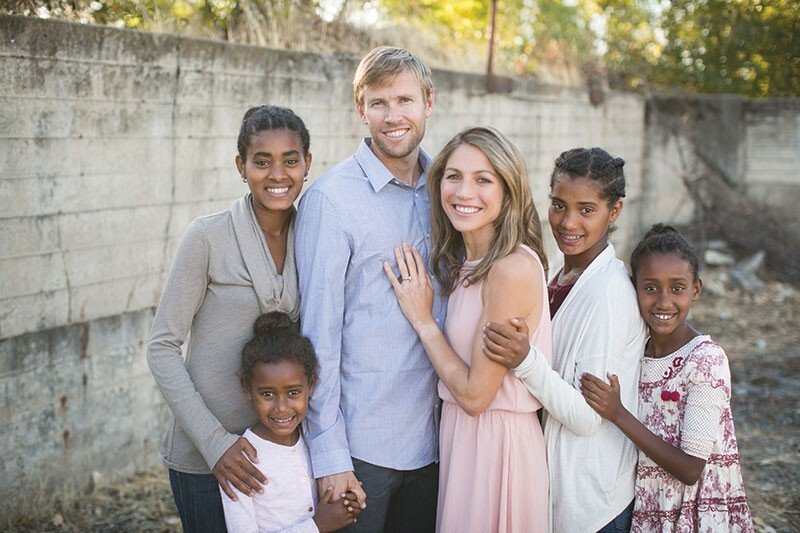 After meeting their daughters-to-be, the Halls visited Ethiopia every other month, and after two and a half years were able to take their daughters home. They have since made many trips back to Ethiopia. Their daughters' roots and their dedication to eliminating poverty worldwide prompted their focus on those in need in Ethiopia. "We are looking for sustainable ways to empower people out of poverty and not just surviving but thriving, as well as providing care for those already orphaned and vulnerable," Hall explains. Hall looks forward to spreading awareness as she and her husband continue their careers. The Steps Foundation "has become a literal fulfillment of using our platform to engage the running community and fund some incredible projects."